I’m at Mile 35, Haines Highway. The mileage marker tells how far we are from Haines Alaska, Five more miles would take us to the Canadian Border. 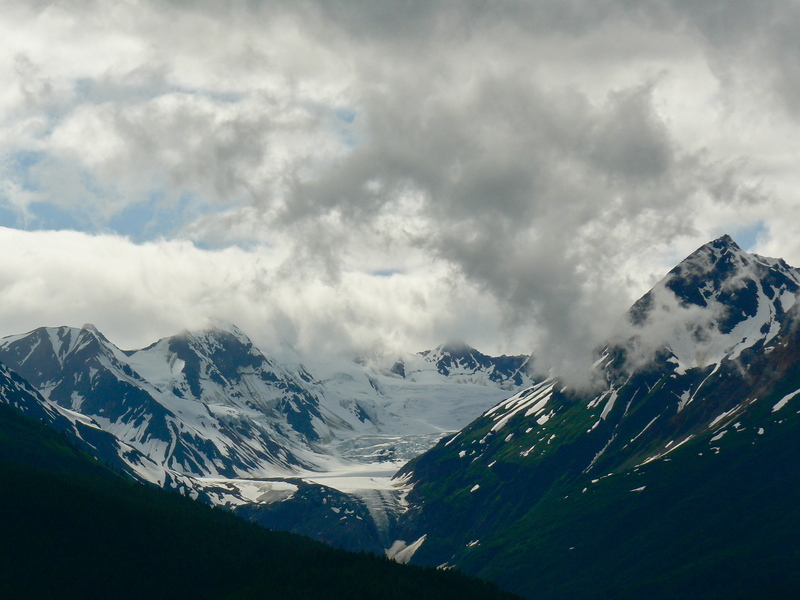 Slowly low clouds lift from the peaks across the Chilkat River to offer us something to paint. Aki, who has little patience for watercolor painting, is back in Juneau so I sit alone with a mentor. She has come to this milepost many times to paint a hanging glacier that spits two alpine shaped peaks. A bit older than me, this is may be her last chance to capture the contrast of high summer green hills with the blue and whites of the river of ice. Imbued with patience by years of successful painting, she tells me to slow down and use applications of different paints until a honest color match shows up on my paper. I stop painting and watch — her brush then the glacier then her moving brush. Her pigments tells her story of the mountain and ice and her many hours spent painting Alaska mountains. Depicting dark gray mountain granite with an equal shade of purple, she slowly moves Milepost 35 into her world. Having made a good start with a few hours of work, my mentor puts away brush and paint and we return to Haines. 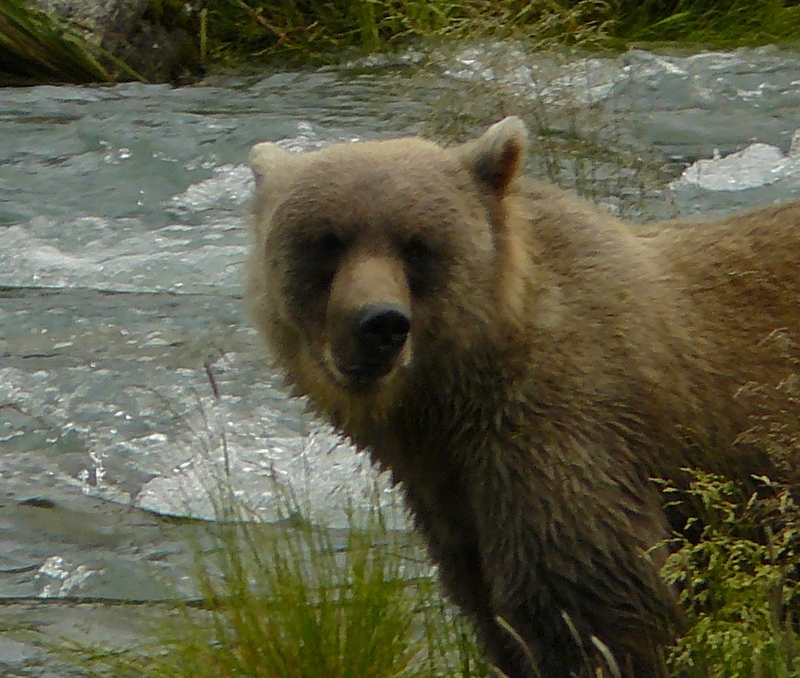 Latter with only a couple of hours before I have to board a ferry back to Juneau, we drive along the shorter Chilkoot River and spot a fishing Brown Bear. It strolls through chest deep water, passing men fishing for Sockeye Salmon until it finds the head and backbone of a recently filleted salmon. We leave the car to stand with other visitors, some sipping from beer cans to watch the big animal feed. 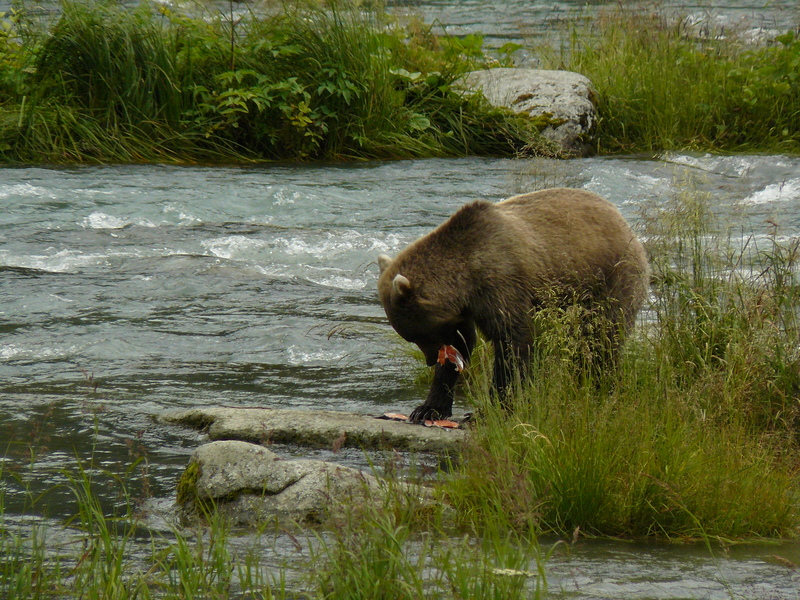 Being only a hundred feet away, we all have a great chance to watch the bear tense his muscular humped back while ripping off strips of red salmon flesh. He is a beautiful wild thing who could kill anyone of us in a flash but we all stay. He only reacts to our presence when my mentor speaks. Then he looks at her — not in anger but with a little concern. 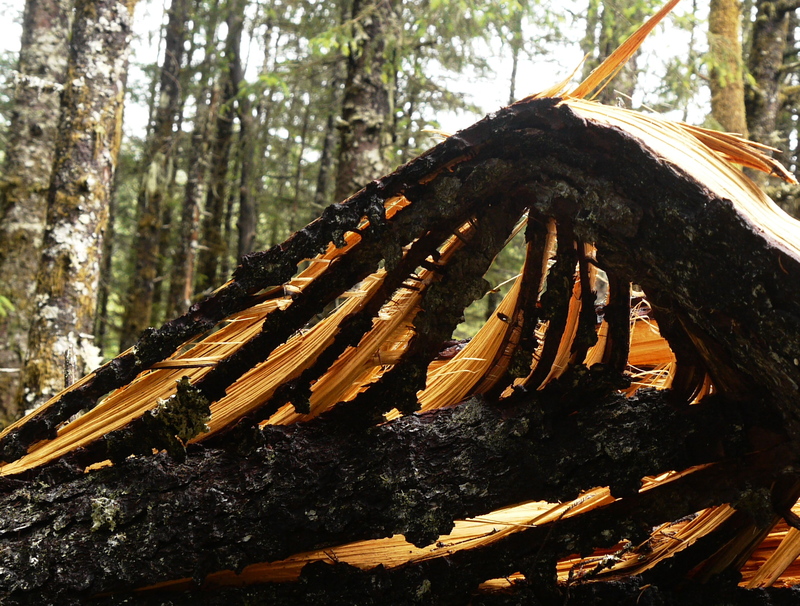 This entry was posted in Aki, Dan Branch, Kwethluk, Montana, Southeast Alaska on July 29, 2012 by Dan Branch. 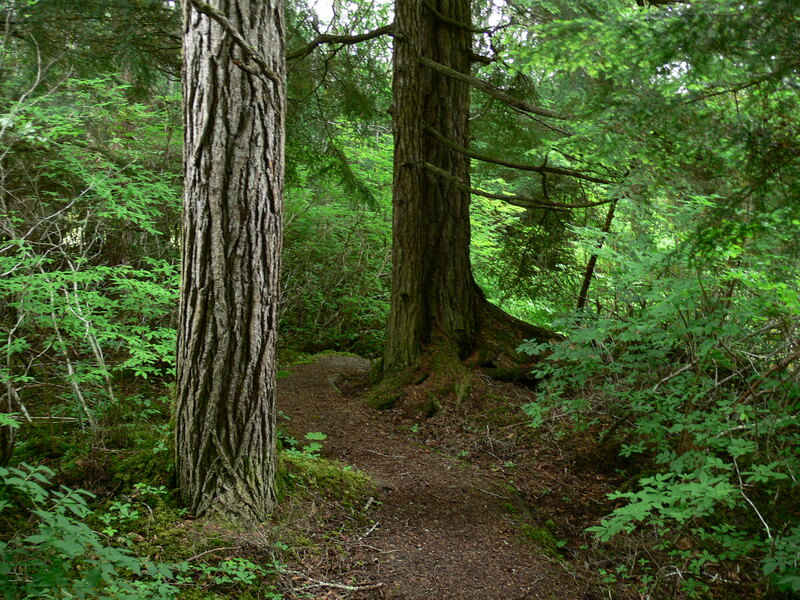 This trail to the Wetlands wanders along a gentle contour line through spruce and hemlock trees to the beach. Aki and I have it to ourselves on grey but dry morning. Perhaps remembering all the birds and seals we have seen on the beach in the past, she pushes ahead, ignoring spats of white eagle spoor and down scattered on the understory plants. The big birds use the forest as a waiting place. Today, with the beach exposed by a minus tide, they must be there. Keeping up with Aki’s breakneck pace I reach the beach in minutes and find nothing but a diminished river flowing to the sea. No shore birds hunt on the clam flats and no waterfowl pass us on the river. Even though it’s time for the chum salmon to move up river in their green and red spawning stripes, none break the water surface. What was once a theatre has become a library so I concentrate on stories written on the rocks and beach grass. Above the high tide line a collection of rocks sport orange lichen and white eagle spoor. Nearby grass white/gray gull feathers and one of an immature bald eagle lay trapped in the tall beach grass. 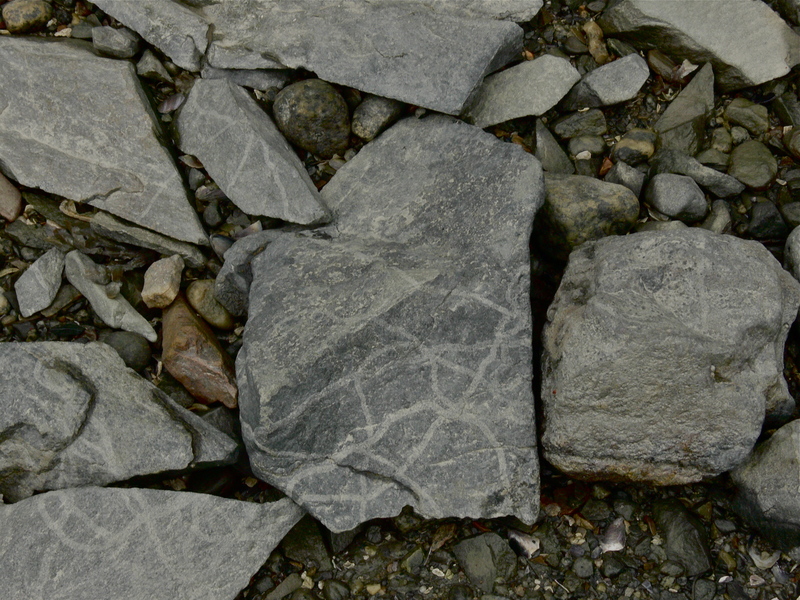 The faint tracks of a wandering snail mark flat beach rocks. God could use the tracks to communicate with His people but I can’t decipher the message, which will soon disappear under the incoming tide. The last lesson lays in the a small “V” shaped cove where the line between wet and dry gravel marks last’s night’s high tide. In the trees above ravens begin a strange song that starts with a low croak and cascades up in a short series of harmonious notes. 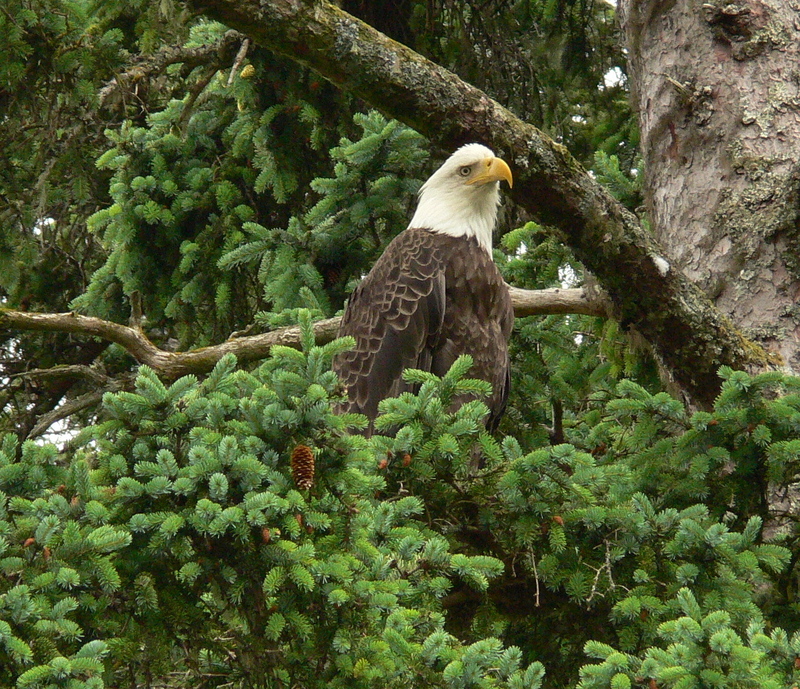 Then an eagle breaks from a beach side spruce. Looking beyond we spot the birds. 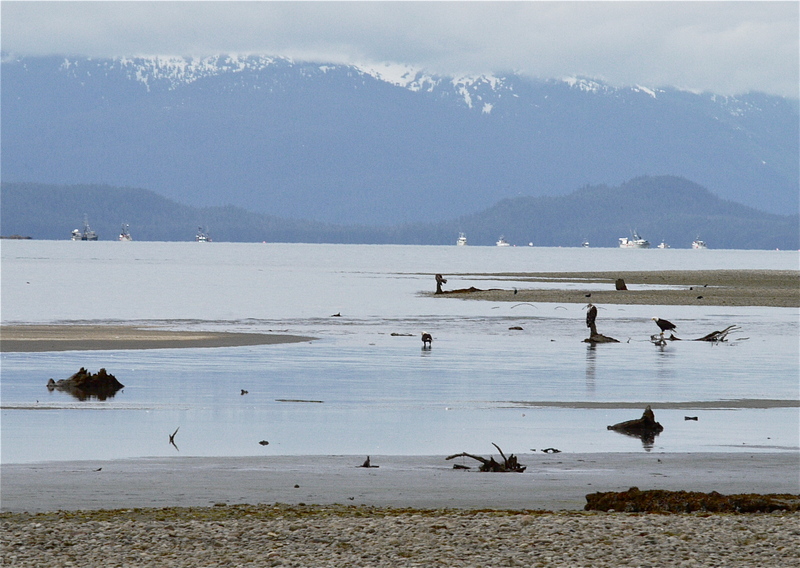 There are eagles, of course, and little waders. 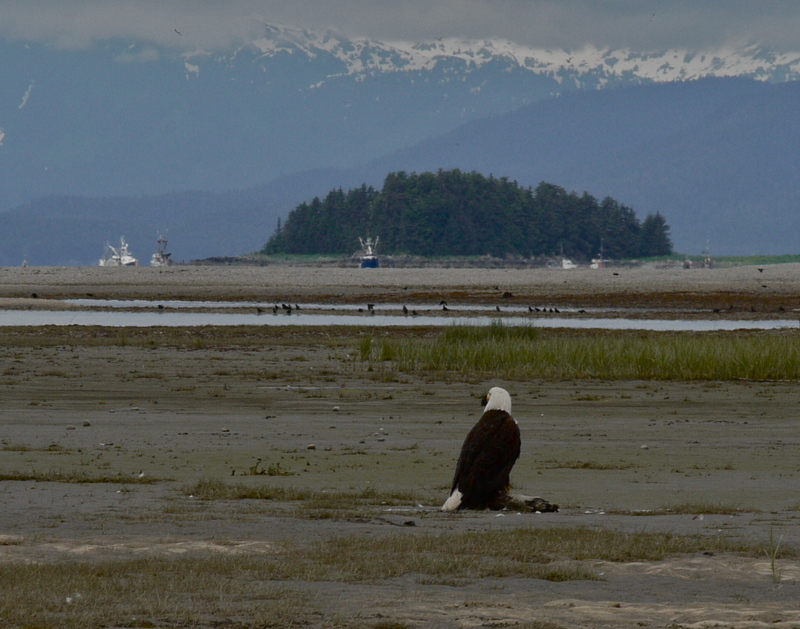 Two mature Bald Eagles perch on separate drift wood snags and look toward shaman Island. A gang of gulls feed near the river’s edge. To reach them we have to cross a large sand flat infested with clams. Some squirt water over the sand when we start walking toward the gulls. Getting closer I am pleased to discover they are Bonaparte’s. The petite black headed guys look toylike on this beach dominated by ravens and eagles. Aki must respect them too for she doesn’t chase the gulls even when they fly a low trajectory away from us down the beach. 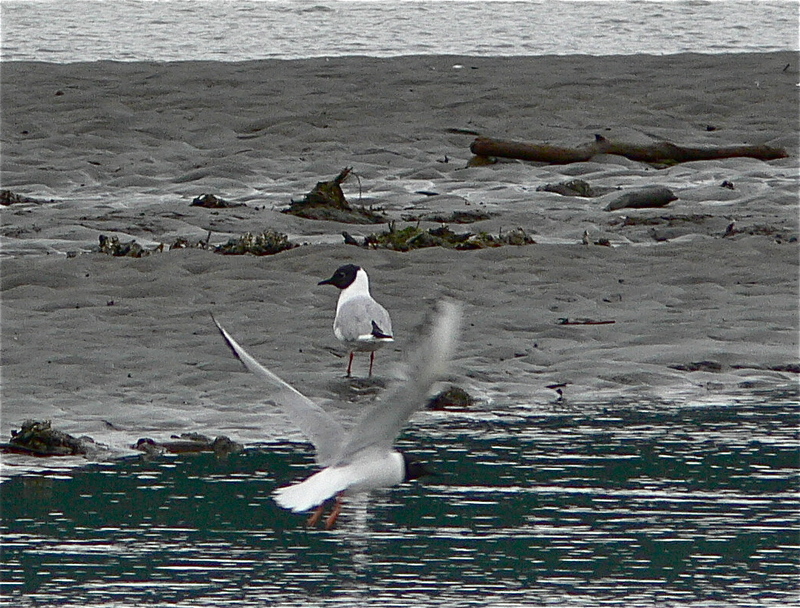 This entry was posted in Aki, Bonaparte's Gull, Dan Branch, Juneau, Kwethluk, Nature, Southeast Alaska on July 22, 2012 by Dan Branch. Aki searches for friends on this dog walker trail but I sink into the calming grayness of this overcast day. Our simple walk into the mountains starts at the front door then climbs along Gold Creek and into the Perseverance Basin. After passing the old Craftsman houses on Basin Road we turn onto a high wooden bridge where the sound of Gold Creek begins to carry away last’s week’s stress. 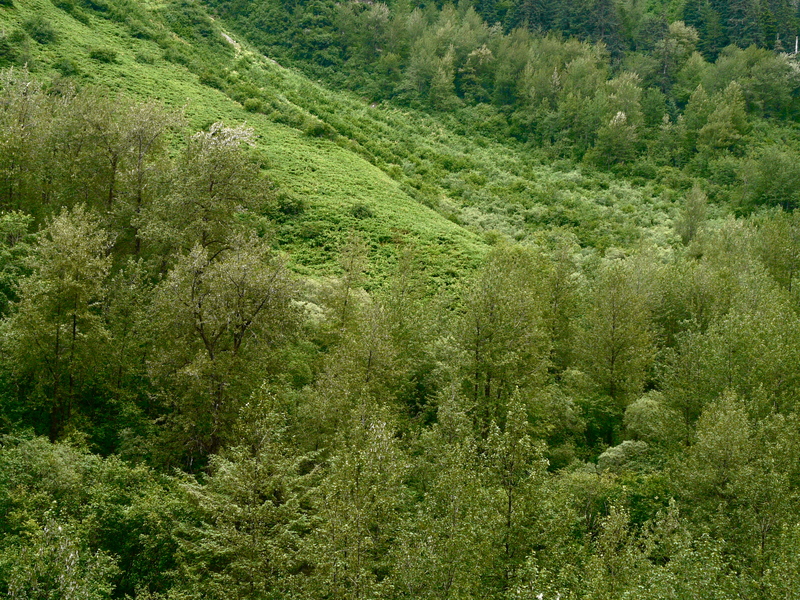 Common trees and plants dominate this portion of the canyon. Cotton Wood trees rise tallest here now having scattered the last of their seed down over the understory. Aki sneezes when sniffing white islands of down formed at trail edge. Some of them join other seeds hitching a ride in her fur. 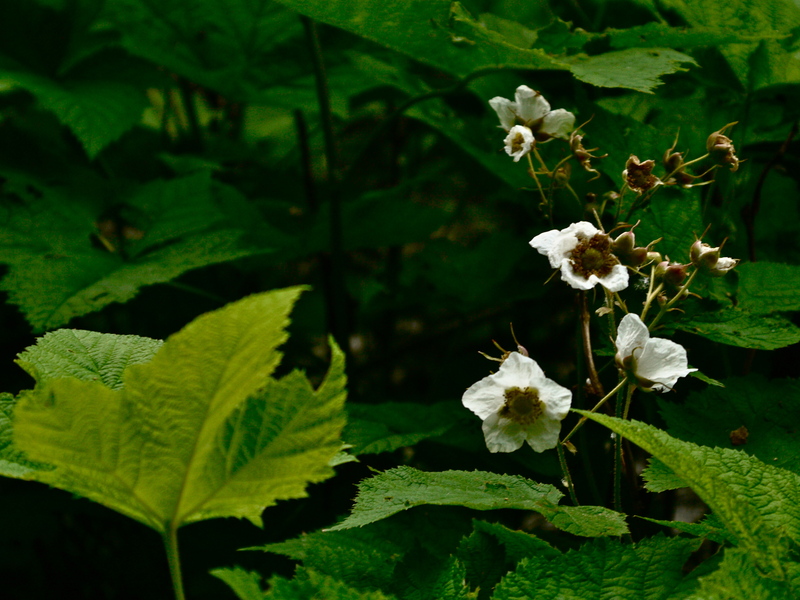 The white flowers of our humble Thimble Berry lay open to the grey light. Some petals fall into cupped leafs below to mix with Cotton Wood down. I understand, for the first time, how they could be called beautiful. 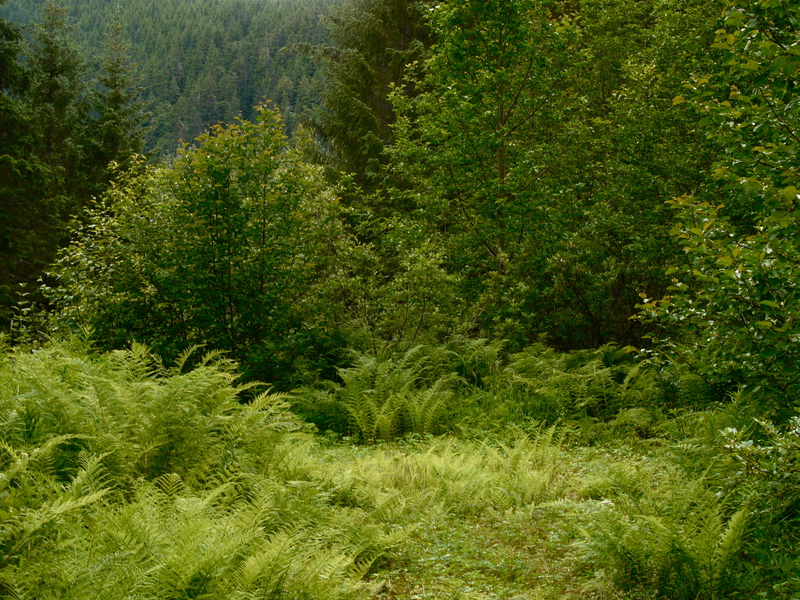 Leaving the main trail we transit a flat forest formed in a Gold Creek oxbow. Treasures grow inside — the purple blue blooms of a Monkshood mixing with a few red Wild Cucumber berries. 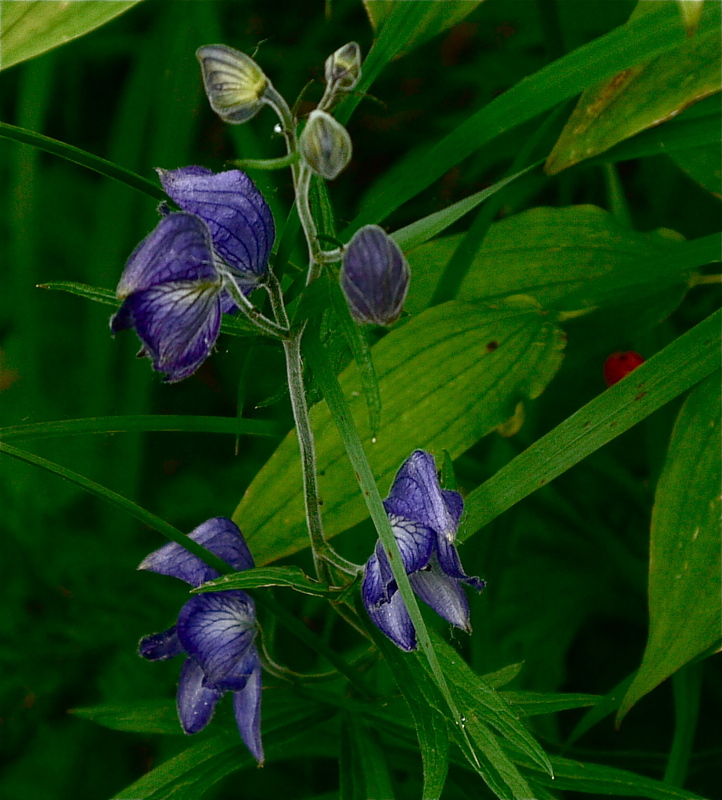 The Monkshood’ pious beauty gives no warning of the plant’s poisonous nature. 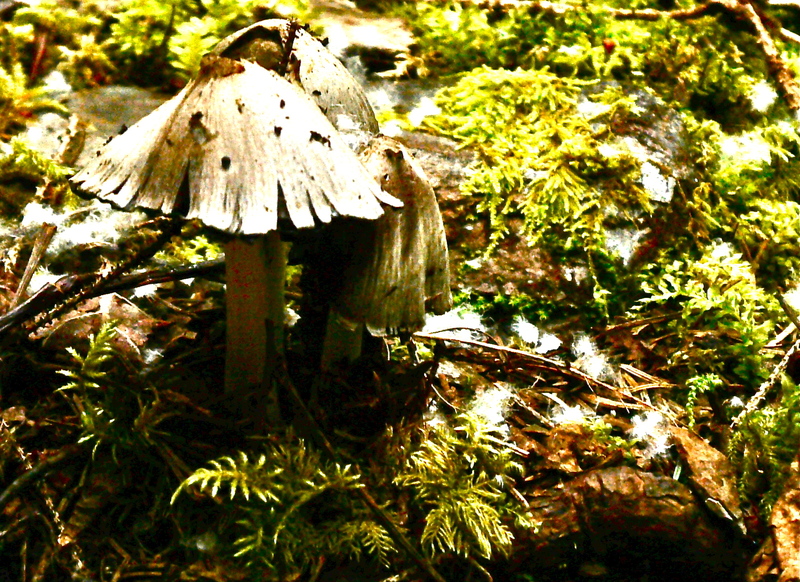 Just beyond on ground whitened by Cotton Wood down is a huddle of Ink Cap mushrooms. These finds please me beyond reason but that is normal when finding a bit of glory surrounded by the mundane. 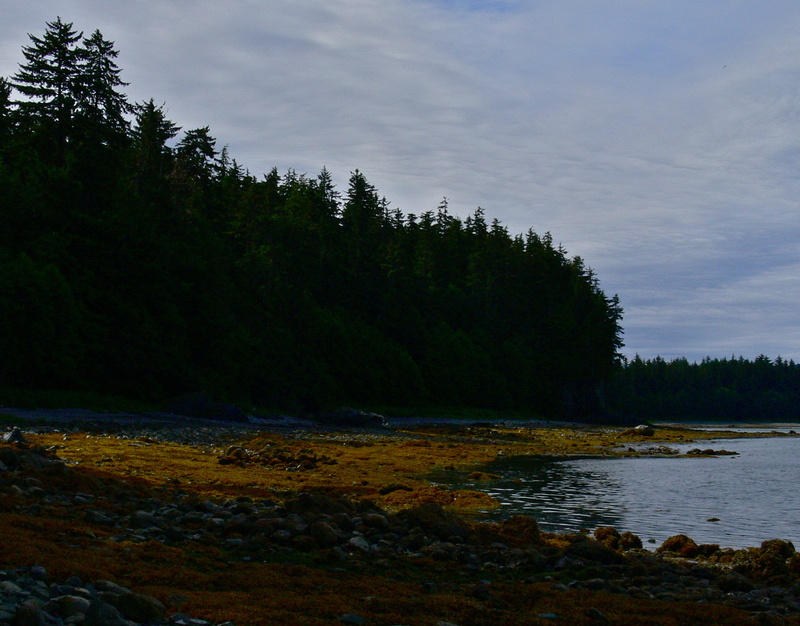 This entry was posted in Aki, Dan Branch, Juneau, Kwethluk, Nature, Southeast Alaska on July 21, 2012 by Dan Branch. A child could re-create this riverine forest with green and brown crayons. Without strong sunlight to bring out detail the plant forms blend into a restful mass. Aki and I walk through it in silence. I spook a Varied Thrust which flies without squawk or song into a cottonwood to stare down on us in silence. Wanting to keep my hands free of repellant for berry picking I’m defenseless against mosquitos but none buzz by. It’s as if all the animals have deserted this lovely place except for a far off raven croaking out complaints. Many would relish an opportunity to walk through this quiet verdant place. Having enjoyed a fair bit of drama lately I’m jaded enough to look for some flash but only a light shower of white cottonwood seed down breaks the monopoly of green. The feathery white flakes drift down to collect in the palms of devil’s clump leaves like snow. There is this small spike of white orchid blossoms smelling like Parisian perfume and just ripe blueberries — our first forest harvest of the season. Using the last of my five senses in the forest I savor their complex tartness. 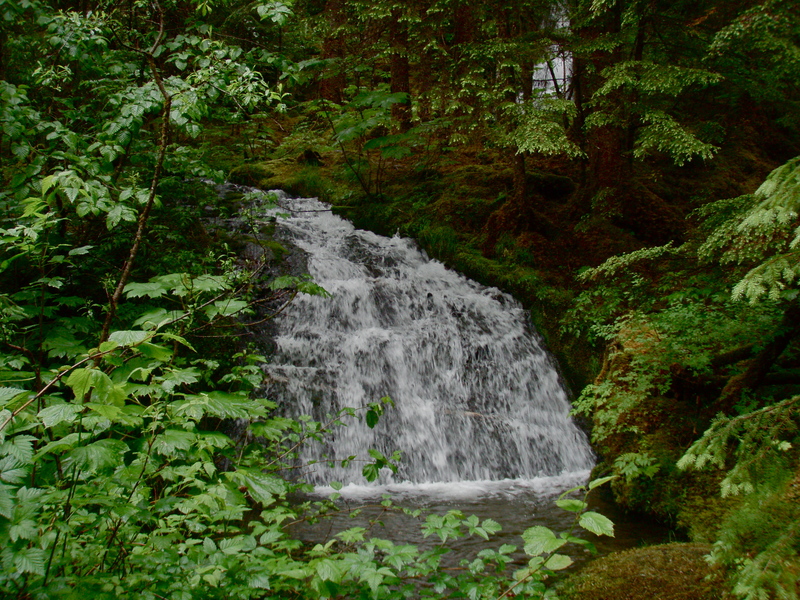 Human voices reach us when we near the forest edge made by a family of three. They talk loudly to warn the bears of their presence. We hear then long after passing then on the trail and I am relieved when Aki and I reach the big tidal flats. Here a dozen bald eagles have spread themselves at the edge of the water. They all look seaward, as if monitoring the progress of our large gill net fleet now harvesting sockeye salmon as they try to reach their spawning grounds on the Chilkoot River. A murder of crows form a dark line on a shrinking island of sand. Some bicker for space but most just search the sand for food. Beyond them a large dark shape breaks the surface. I guess whale but it is too far off for me to be sure. I lead Aki over the sand flats toward the water to get a better look. Some dogs might chase after crows or eagles but she stays quietly by my side. Nearby a mature eagle stands, its talons gripping a small piece of drift wood. We circle it at a respectful distance until it stands between my camera and the Herbert Glacier. 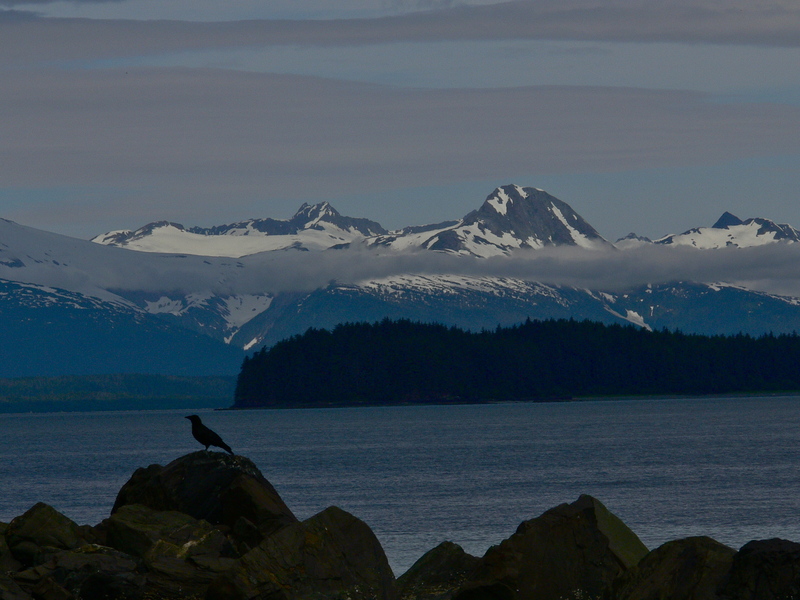 This entry was posted in Aki, Dan Branch, Juneau, Kwethluk, Nature, Southeast Alaska on July 18, 2012 by Dan Branch. Absence is the theme for this walk around False Outer Point. I stay away from here during early summer when the chance of catching a king salmon from shore draws big crowds. Then bon fires burn on this beautiful beach and a community of fishermen form on the point. Today, with the kings now up in the spawning streams, only one car sits in the trailhead parking lot. Aki loves this trail and I have to hurry down it to keep up with her and she charges ahead. 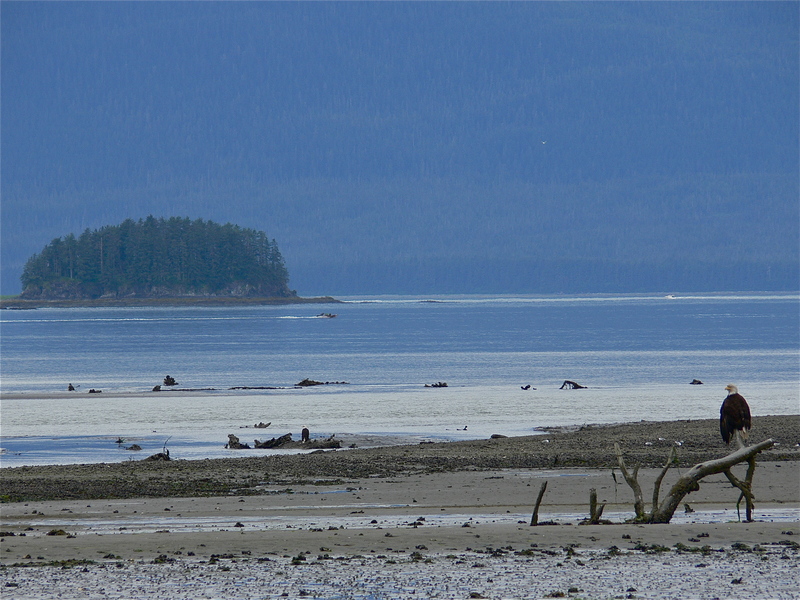 She slows where we reach the crescent beach, now half exposed by the outgoing tide. The signs of man are everywhere but I can’t spot the owner of the other car. Someone has fashioned a spiral shaped labyrinth out of smooth beach stones but we don’t try it. When Aki stops to drink from a runoff stream I scan the ocean for life and at first see only timber covered islands and the glacier beyond. No whales, porpoise, ducks or geese appear. Then a large dog salmon performs several leaps out of the water, ending each with a happy splash. It’s as if he wants one last celebration before the fight for spawning space in the redds. A noisy gang of crows occupies the point. After chasing off the ravens and eagles that usually hang out here, they have little patience for us. A couple fly low over me but don’t bother with Aki. By rounding the point we reach a pocket meadow still moist from the retreating tidal water. Surrounded by barnacle incrusted rocks, only salt tolerant plants can survive in the meadow. I can’t remember seeing one like it on our other travels. The sun breaks through briefly to light up the golden yellow rock weed covering portions of the beach nearest the water. Only artists that can recreate this color on canvas have a chance of conveying the beauty of a Southeast Alaska beach to others. Around the next headland I spot two people sharing a conversation in a flat grassy spot between trees and the beach. As we approach I can see their camping gear. When they spot us, the campers begin to pack things away. The woman, at first standing straight and upright, bends her torso like a dancer taking a bow. Her hair forms a blond cascade that bounces as she stuffs a sleeping bag into its stuff sack. The campers move quickly enough to raise suspicion. Are they embarrassed by being caught acting out what seemed like a good idea last night at the Imperial Bar? More likely they are hurrying back to town for hot breakfast and good coffee. They’ve camped just beyond a trail junction where Aki and I take a path leading into the woods so we don’t meet them. I stop from time to time to pick blue berries, which gives the campers time to almost catch up. The possibility of them doing this causes me to walk faster until we leave the main trail from a seldom used route that will lead to the car. The campers, who must own the other car parked by the trailhead must also know the way for I hear the man’s voice rising above forest bird song when we reach the road to home. Arriving back at the parking lot just before the campers I am relieved to have avoided the forest equivalent of an awkward elevator moment—the one where you are in an tall building’s elevator with someone your barely know that works for your employer. Stuck in a moving box you first wrestle with whether to initiate a conversation and then after giving in to that temptation, the effort to maintain it until the elevator debouches one of you. The conversation is always about the weather. I can only talk about rain for so long. 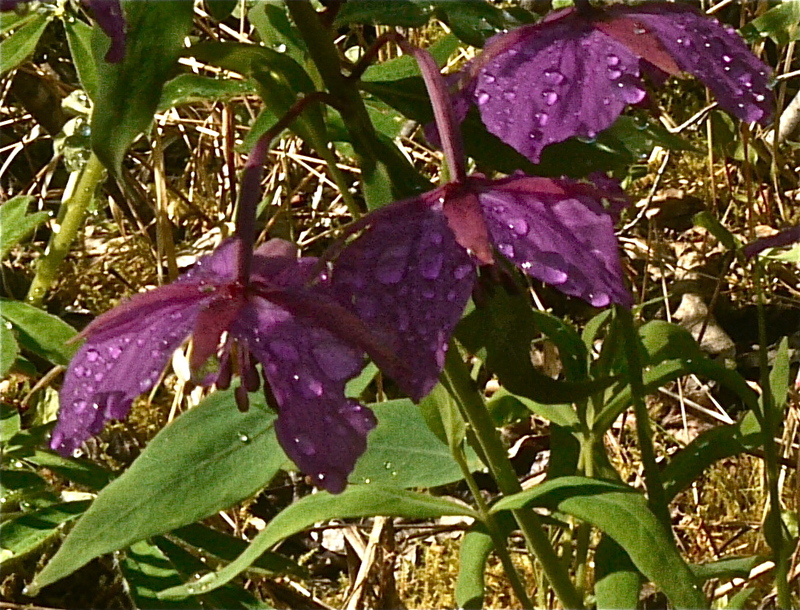 This entry was posted in Aki, Dan Branch, Juneau, Kwethluk, Montana, Nature, Southeast Alaska on July 15, 2012 by Dan Branch. Rice, smoked salmon and ripe avocado rolled up in nori (dried seaweed)— comfort food in our Southeast Alaska home especially when taken with dark Swedish coffee. Aki watches me eat it from her perch on the sofa arm. She doesn’t mind. She had her smoked salmon for breakfast before our passage through the Troll Woods. The morning sun made a surprise appearance on the moraine trail leading to the woods. 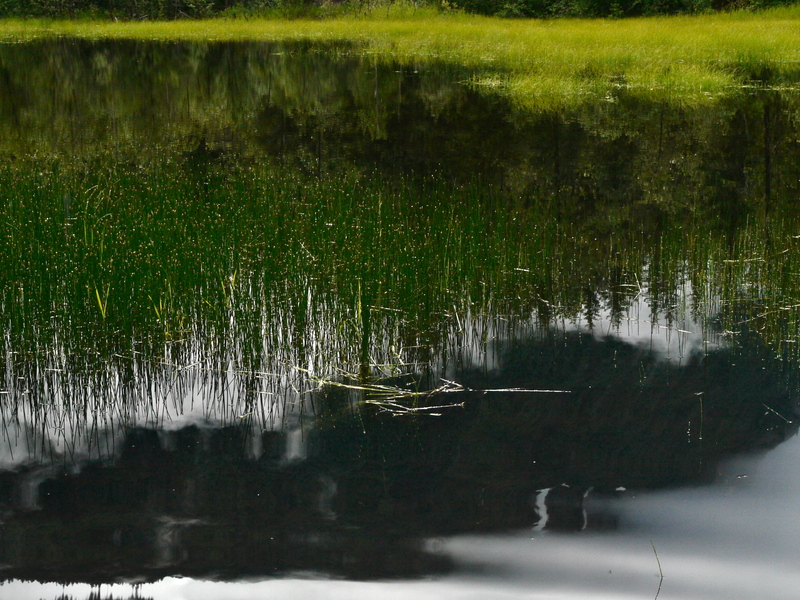 We see blue sky reflected in calm lake waters and sunlight gathered on the rain soak plants growing along the trail. Wanting solitude more than sun this morning I take Aki into the Troll Woods, which is still as cold as the previous night. 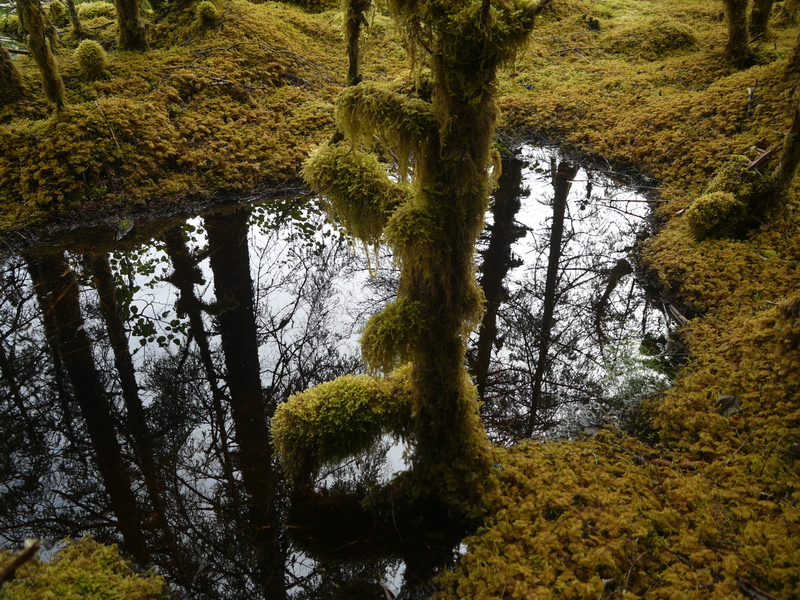 We move down the moss covered trail in silence and peace until Aki stops to inspect a scene of small devastation. 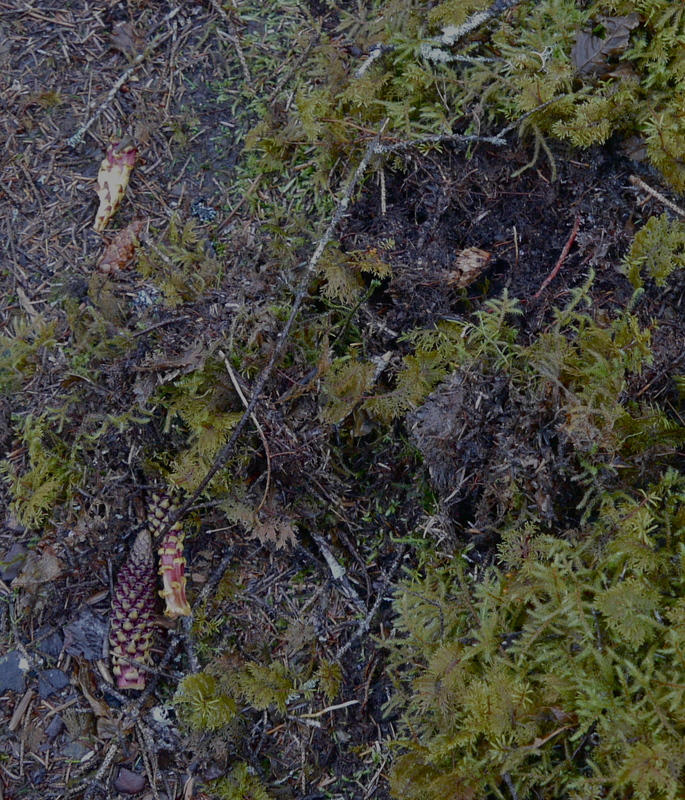 Shattered pieces of Broomrape lay on the trail, its roots dug from the ground by a passing bear. We find more dig sites further up the trail. Aki takes it all calmly so I know the bear isn’t near. Our relationship is like that. She relies on me to pick the right path while I expect her to warn of danger. Each have expectations for the other and most are fulfilled. I take out the camera while approaching the young beaver’s lake in hope of a photo of him near the shore. That plan is shattered by the splash of a large bird dog and the loud voices of it’s owners. We wait at the edge of the woods for them to move on. They do but the beaver does not reappear. We take a seldom used side trail to the flooded beaver lands but high water cuts off the path. Aki barks a greeting to a noisy gang of dog walkers moving along a parallel path. I want to tell her not to reveal our location to the enemy. It’s time to back track to the car. We could secure solitude by taking the Troll Woods path but now sunshine floods the open moraine trail so I forgo silence for light. Aki should be pleases as it increases her chances of running into other dogs. One does appear — a black lab plunges into one of the beaver lakes. Aki must have heard the commotion but stays quietly at my side. Together we walk in the sun to the car. 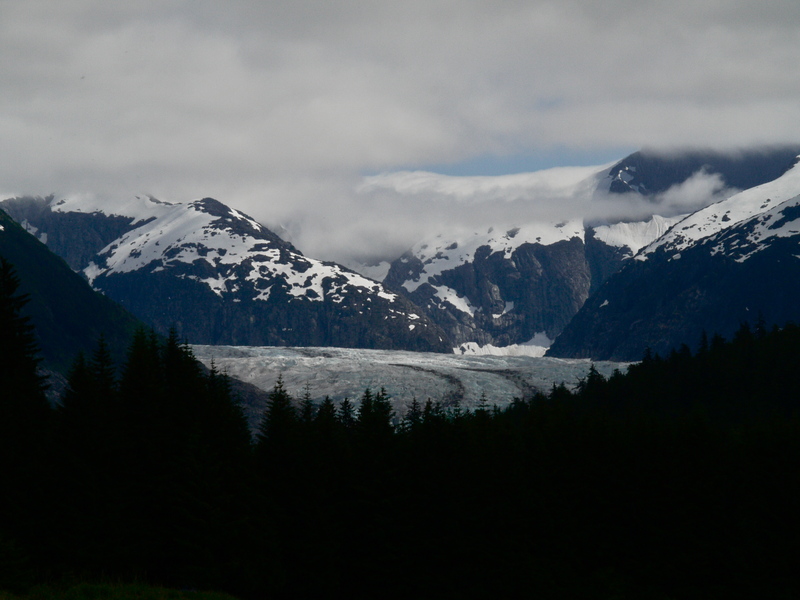 This entry was posted in Aki, Beavers, Dan Branch, glacier moraine, Juneau, Kwethluk, Nature, Southeast Alaska on July 14, 2012 by Dan Branch. This boulder has no soul. I know this and know that it does not breathe, bleed or feel emotion. If it did we could admire it for courage and patience. An advancing glacier ripped it into life from a granite bed and carried it toward the sea. When riding in the interface of land and ice the boulder cut long straight grooves in the passed over rock. Later the ice entombed it until it broke to the glacier’s surface. Then the glacier retreated back over this flat ground and dropped the boulder here where we call it an erratic. Imprisoned by inertia, its life of adventure over, the erratic rested here with patience, as naked as the rest of the moraine left behind by the failing river of ice. Pioneering moss moved in and softened all sharp corners with a brown and green blanket. That’s what Aki and I see today. 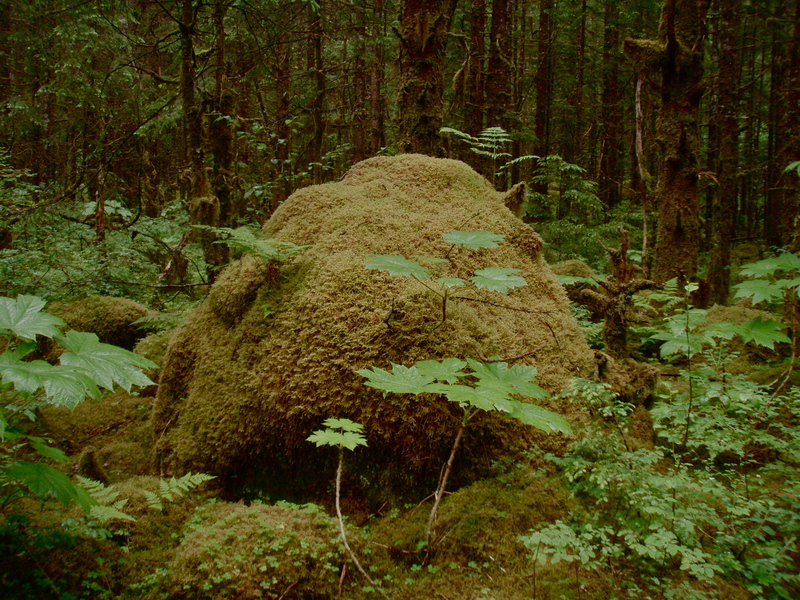 A troll could pass through this moss covered boulder field without making a sound or stubbing a toe. We enter it and wander in rain until we get just lost enough to inject some adventure. Aki hangs back at my heels but doesn’t break back to the trail. Without landmarks I take the easiest path through the woods. We could be miles lost. Aki breaks suddenly to the right, runs ten feet, and then turns back with an invitation to follow. 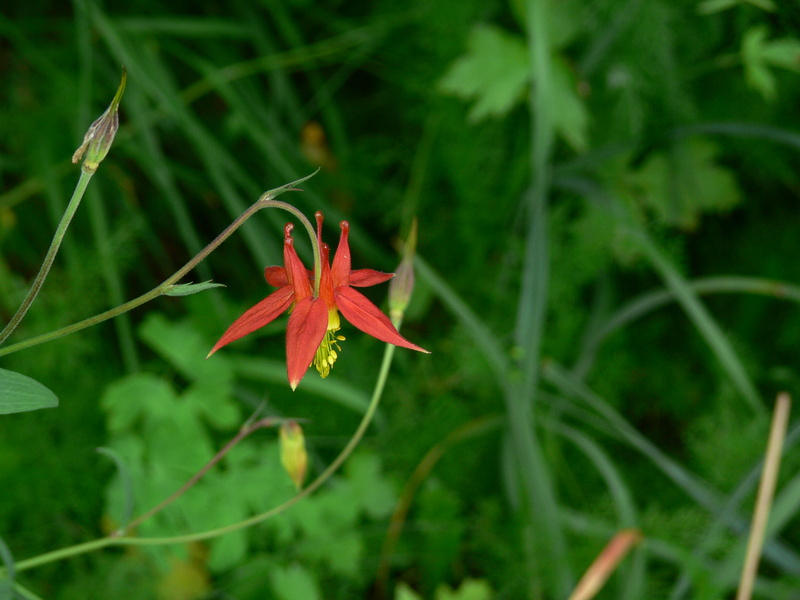 I do and soon we are back on a trail lined in thick green brush and a scattering of pearl pink orchids. 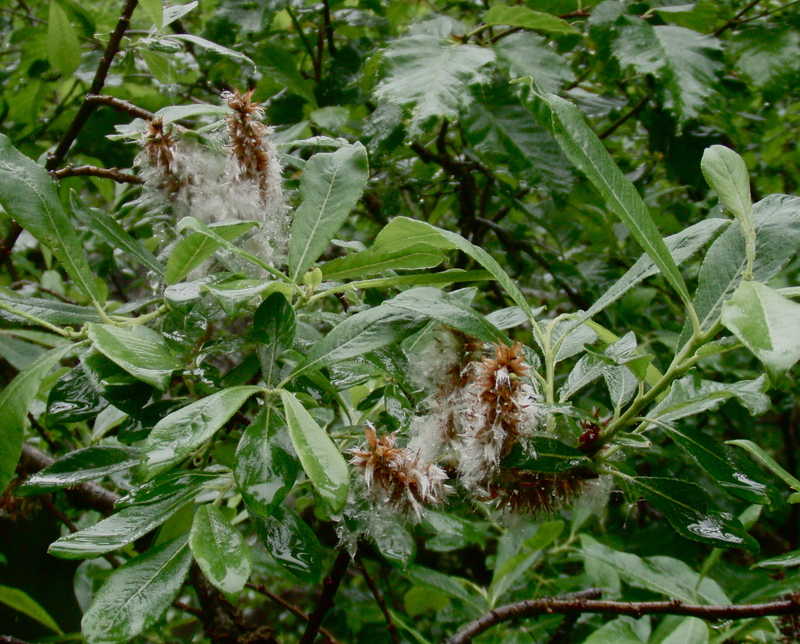 This entry was posted in Aki, Dan Branch, glacier moraine, Juneau, Kwethluk, Montana, Nature, Southeast Alaska on July 7, 2012 by Dan Branch.